This article caters to the needs of a gamer who is looking to buy the best gaming laptop under $800 price. After due research and analyzing user reviews, we have picked 10 gaming laptops to play the games like WoW, D3, Wolfenstein 2, Star Wars Battlefront 2, Prey, COD Infinity Warfare, FIFA, NFS payback and all the modern AAA games. To qualify as a decent gaming laptop, it must be equipped with a dedicated GPU with internal memory, at least 8 GB RAM, solid keyboard, full HD display screen and high quality in-built sound speakers. The following list is definitely going to impress and even surprise you with flagship specifications at this price range. This gaming laptop is priced below 800 dollars. It comes with 15.6 inches of screen that is powered by In-plane-switching (IPS) technology that produces true colors off the display and enhances the viewing angle. It has a Full HD screen with maximum resolution of 1920×1080 pixels. The GPU is provided by NVidia with its powerful GTX 1050 chip with dedicated VRAM of 4 GB DDR5. This budget friendly laptop will surprise you with its speed and overall performance. You can not only play World of warcraft but surprisingly the high resource demanding game like Witcher3 runs smoothly on Acer Nitro. The other key feature of this gaming beast is its cool-boost technology that keeps the palm-rest cool even if you play games for longer durations. This is a gaming laptop with powerful features yet it is not going to break your bank. This is an affordable gaming Idea pad that runs the modern AAA games smoothly without any lags. The power of Intel i-7 quad core processor with 6 MB cache and turbo boost technology is enough to beat the rivals in a LAN party. The Lenovo Y700 is already equipped with AMD Radeon RX 550 discrete GPU with 2 GB video memory for intensive gaming. You get rich gaming experience on 15.6 Inches Full HD anti-glare display screen powered by latest IPS technology. Can you imagine buying a gaming beast equipped with Intel i7 power that is priced under 800 dollars? Well! we have found this one for you. It is an Asus FX53VD with Quad core i-7 processor, 8 GB RAM, and NVidia Ge Force GTX 1050 graphics processing unit with video memory of 2 Giga Bytes. It has a full size numeric keyboard with solid keys that gets illuminated with backlit technology. Designed for multi-tasking, it is an all-round laptop for work and play. With the built-in SSD of 256 GB capacity, you can rest assured of fast file access and quick booting. This laptop can handle any CPU and graphics intensive applications with ease. Thanks to its powerful Quad-Core i5 processor with 6MB cache and GeForce 1050 dedicated graphics unit. The GPU is powerful enough to run the games like Prey, star-war battlefront 2, Wolfenstein 2 and similar games at 1080 pixels. Dell Inspiron 7000 is loaded with 8 GB RAM and a hybrid storage device consisting of 128 GB SSD and 1 TB HDD. The laptop offers connectivity through a number of ports that includes HDMI, USB 3.0 with power-share functionality, Bluetooth 4.2 and much more. The laptop comes with pre-installed windows 10 OS and comprises a 6-cell battery for enhanced backup. The full size numeric keyboard with backlit feature is surely going to impress gamers in this price range. Buy Until the Stock Lasts. This gaming laptop gives a stiff competition to a gaming desktop PC as far as robustness and performance are concerned. Unlike other gaming laptops in the top 10 list which runs on Intel processor, this one is powered by AMD quad core processor. The laptop runs the applications and games fast but the only con is the heating issue. Playing the games for longer durations might heat up the laptop. It is a sleek laptop but houses powerful hardware inside that includes 8 GB DDR4 RAM and 128GB SSD for fast booting and an additional hard disk of 1 TB for storing games and other vital programs. This portable laptop has a brilliant display screen with full HD functionality which is powered by AMD Radeon RX 460 GPU with 4GB GDDR5 video memory. Furthermore, Dell Inspiron 5000 features six cell battery, high speed 802.11 ac network, HDMI, USB Type-A and media card reader. Know More Details. This laptop is definitely going to impress you with its premium features and a budget price which is a rare combination in laptop marketplace. It is bound to satisfy the needs of gamers who want to play FIFA, NFS payback, D3 or WOW. Now let’s peep into some of the features that make this laptop standout in the gaming market. To take care of multi-tasking and faster access to files, it is equipped with Quad Core i-5 processor which can turbo boost to 3.2 Giga Hz clock and 8 GB DDR4 RAM. To enhance the gaming experience, the Idea-Pad is powered by dedicated graphics NVIDIA GeForce GTX 960M chip and integrated JBL sound system. This is a one gaming laptop that falls under 800-dollar price and features a powerful NVidia GeForce GTX 1050 Ti graphics processing unit (GPU) which offers better performance than GTX 1050. With premium specifications like Intel i5 processor and 8 GB of DDR4 RAM, Dell Inspiron flagship model is a good choice for gaming and streaming. The laptop is equipped with 256 GB SSD storage drive and a 15.6 Inches FHD display screen. The full numeric keyboard comes with a backlit feature that helps the gamers to play at night without disturbing others in the room. This Dell gaming laptop is designed for Windows Mixed Reality Ultra experience which is a rare option in laptops under eight hundred dollars. It is pre-loaded with windows 10 and is one of the sleek laptops that has a robust and durable body. Check More User Reviews on Amazon. Dell launched this new gaming laptop in 2018 and comes with an elegant design and premium features at an affordable price below $800. It has a solid black metallic body with a beautiful Dell logo in red color on the back of the laptop screen. Said that, you can enjoy your favorite games on an anti-glare screen for longer durations without straining your eyes. The size of the screen is 15.6 inches and displays full HD display for enhanced clarity in games, movies and other media files. Moreover, this robust chassis houses powerful hardware components that include Intel Core i-5 processor (6MB Cache), 8 GB RAM and NVidia GeForce GTX 1050 GPU chipset with 4 GB VRAM. This is a real value for money laptop for gamers and they can boast of a large 17.3 inches’ FHD screen with powerful specifications. Available in obsidian black, Acer Aspire E-5 is powered by Intel i-5 2.5GHz CPU and 8 GB DDR4 RAM. Furthermore, it is equipped with a graphic memory of 2GB DDR5 on dedicated NVIDIA GeForce GTX 950M GPU. A large screen enhances not only the gaming experience but you can work on any graphics application with more detailing and minutely. Getting a laptop with 17.3 inches’ screen that is priced less than 800 dollars is in itself a big achievement for gamers. You can play and store your all modern AAA game titles on a fast 256 GB SSD and 1 TB HDD. This gaming beast has one of the solid chassis and the laptop weighs around 9.3 pounds. The hinges are durable and strong and can withstand minor shudders. 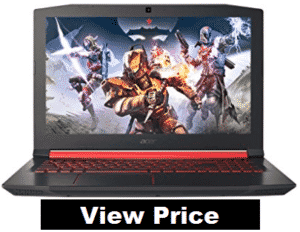 Buy this if you are looking for a 17.3 Inches gaming laptop valuing under $800 with best overall performance. Check More Details & User Ratings. MSI is a well-known name for manufacturing high grade gaming laptops. Although it offers high end laptops with high price tags, you can get a decent laptop at “below-800 dollars” that can run Battlefield-1, COD Infinite warfare, Witcher 3, WWII and much more. With over thirty years of experience in manufacturing graphics cards and motherboards, the laptops are perfectly engineered for gaming by their dedicated team of engineers. On high resolution settings, you get high FPS (frames per second) that boosts gaming experience. MSI uses steel-series keyboard in this model that supports multi-key input for better control over the game. As required by pro-gamers, the laptop comes with a cooler boost technology by installing at least six number of heat pipes to overcome the heating issues. With 3d 7.1 surround sound, powerful i-5 processor, NVIDIA’s GeForce GTX 1050 with 2GB GDDR5 Video memory, 8 GB Ram and 256 GB SSD, this laptop is highly recommended for professional gamers. Check More Details. Below 800 dollars’ mark, it is difficult to find a laptop that can run latest games but you can play them on the aforementioned laptops at medium to high settings. Pick the best one for you and let us know your choice. Also, let us know if we have missed a gaming beast that you want us to include in this list.